Montclair Public Library Gallery, 50 South Fullerton Ave.
Love and Fear at the Library! 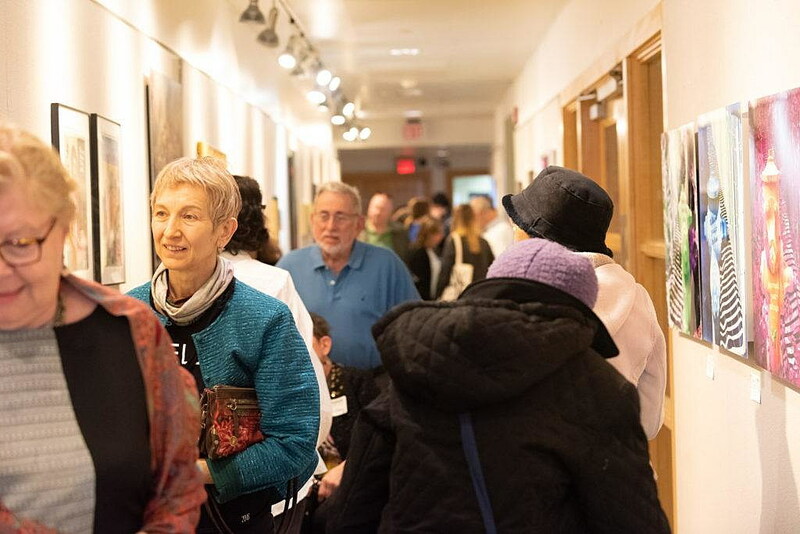 It could be a great title for a novel, or a film thriller, but “Love & Fear” at the Montclair Public Library is a provocative new art exhibit on display through April 29, presented by Studio Montclair as part of its Portfolio Series. Within a half hour of its opening on Sunday, April 7, the exhibition sparked conflict. 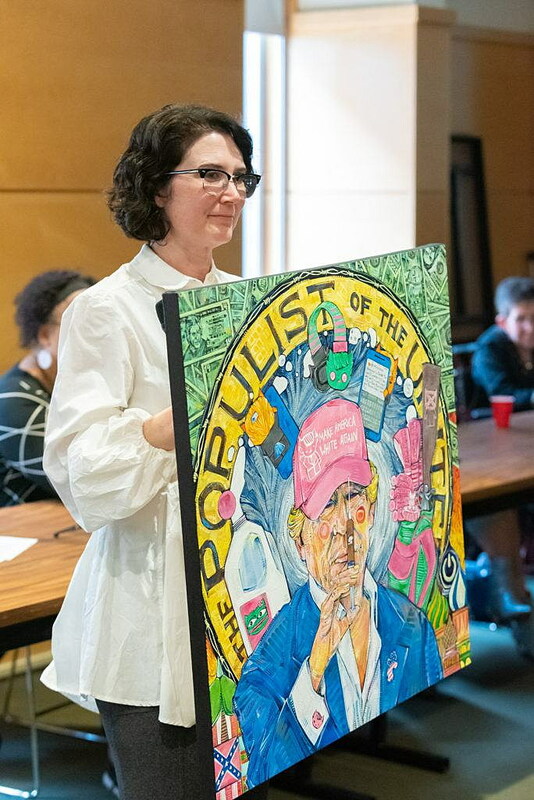 “A lot of people were getting upset,” said Studio Montclair’s executive director, Susanna Baker about one particular painting by artist Gwenn Seemel during a panel discussion held at the library on Sunday. The acrylics painter and art blogger had two pieces in the show, both reflecting “fear in the age of President Donald Trump.” One is a mural of orange-hued faces, Trump at the center, and more than 100 faces of individuals active during his administration surrounding him. The piece is, mounted just at the entry to the hallway gallery from the library, visible through glass doors to every passing patron. But that painting was not the problem. But with the phrase “sh**y, sh**y, sh**y” inscribed in small letters amidst a busy background, SMI decided to pull the painting, honoring a policy of not displaying curse words or nudes in the library’s public space. (They subsequently learned that policy was no longer in effect). It was anguishing, said collection curator, Marianne Trent, who had selected works from the portfolios of six artists for the show — but the choice was made to take down the painting immediately. At a Sunday afternoon panel at the library, five of the artists — including Seemel — were philosophical about the decision. Sandiford’s “Masking Fear” is a self-portrait depicting a distorted face wearing a blue mask, done with iridescent shades on metal. A companion self-portrait expresses her inner feelings in the face of being gossiped about. In fact, Trent said, submissions for the show were predominantly about fear, perhaps because “it is present in such a big way in our lives right now, every day on the news.” Submitted artworks regarding love tended to reflect “smaller, more ordinary” occurrences of daily life, she said. Artist Amy Charmatz, seated in a wheelchair during the panel discussion, remarked that she has suffered from depression, surgeries and physical limitations. However, her work holds up the side of love, sprightly and resilient — despite a difficult journey — in this exhibit. Charmatz’s multi-media pieces are done in primitive style, layered with paint and glitter, and annotated with her original sayings. As to whether controversy is good, the artists did not agree. Landau said she really could not say whether she agreed with Sandiford that art changes lives by exposing viewers to different, sometimes shocking viewpoints. Radsprecher said that powers-that-be are generally “implacable,” immunizing themselves from challenges to their authority. “I do it for myself,” she said, and on that, every artist at the table could agree.